The most obvious unusual feature of the 108 route is its use of the Blackwall Tunnel. It must be one of London’s most difficult routes to operate, as the tunnel is a major bottleneck at the best of times, and regular closures and maintenance work can play havoc with the service. The route is also agonisingly slow for a through journey from Lewisham to Stratford, taking just under an hour for 9 miles as the crow flies. This journey is now also covered by the Docklands Light Railway in offpeak times, taking about half as long, but via Greenwich and the Docklands rather than Blackheath and the Blackwall Tunnel. Originally the route ran from Crystal Palace via Sydenham and Catford to take up the present routing from Lewisham via Blackheath, East Greenwich and the Blackwall Tunnel to Bow. It may seem strange now – especially bearing in mind that Blackwall Tunnel had only one bore then, what is now the northbound bore – but the route was then double deck. The northbound bore incorporates sharp kinks near both ends; this was apparently to avoid horses bolting when they saw the light at the end of the tunnel! Or perhaps it was just to get the tunnel perpendicular to the river at the point at which it passes underneath, to minimise the distance between ventilation shifts. Either way, the bends severely restrict traffic speeds now and results in considerably more traffic congestion when compared to, say, the southbound tunnel or the Dartford Tunnels, all more recent affairs and built fairly straight and wide. Indeed the southbound tunnel is wide enough to incorporate a bidirectional working, which was until recently frequently used in the morning to ease congestion by providing three northbound lanes. Returning to the 108, two batches of double deck buses (NS and STL types) were specifically built for use in the Blackwall and Rotherhithe Tunnels, with specially shaped roofs to improve clearance on the corners. In 1951 the road surface was lowered allowing standard RTs to operate. However, as vehicles got wider and wider over the years it became necessary to raise the carriageway level to make the road wider at the expense of height clearance, which was done during 1967-68 after the new bore opened, so now there are severe height restrictions and the northbound bore can only accommodate single deckers, initially SM class Swifts then LS class Nationals. On 19 April 1944 the 108 sprung an A-suffixed variant running to Well Hall Circus, providing this section of the Rochester Way with a bus service for the first time, and run, like the 108, from Athol Street (C) garage. Initially it ran peak hours only, but soon expanded to a Monday to Saturday then daily operation, and was also subsequently extended into Eltham (Southend Crescent), but then retracted to operate Eltham – East Greenwich only. In the 1960s the 108 was split, with a new Mon-Fri 108B running from Crystal Palace to the south side of Blackwall Tunnel (initially Boord Street, later the Ordnance Crescent/Tunnel Avenue industrial area). The main 108 was curtailed to Lower Sydenham (Fairlawn Park) except at weekends. The 108 was soon further shortened to run between Blackheath and Bow only, the 108B becoming daily. Further re-structuring took place in January 1970, with the 108A withdrawn and replaced by an extension of the 108 from Blackheath. The 108 terminated at Eltham (Southend Crescent), but there being no need to serve Eltham High Street on Sundays it was curtailed at Eltham Church on that day, buses returning out of service via Sherard Road to Well Hall bus station where enhanced driver facilities were available! The 108 was extended at the north end to Stratford in 1977. The next major changes were in 1986 when the 108B was reduced to run Crystal Palace – Lewisham only, with the 108 restored to serve Lewisham and new route 286 taking over the Eltham – Blackheath section of the 108 and the Blackheath – Greenwich town centre section of the 108B. The 108B has since been replaced by changes to the 75 and new route 202. 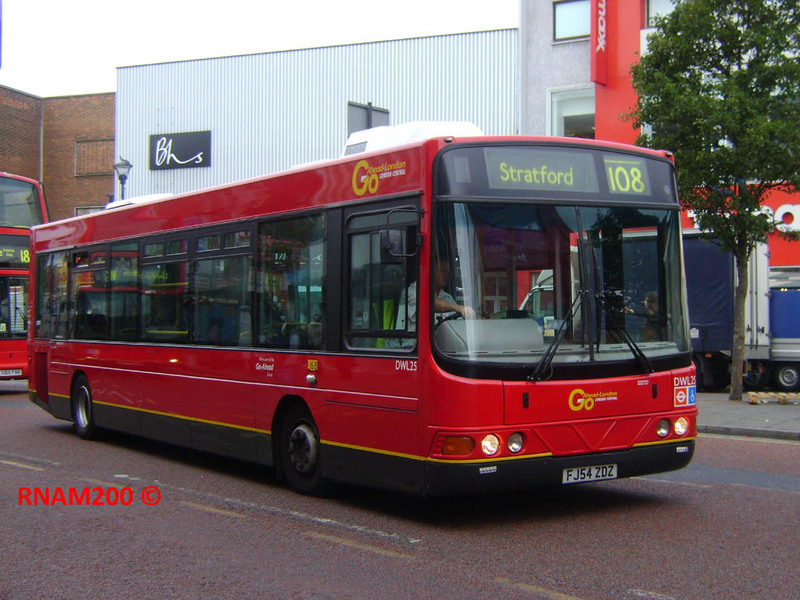 In 1988, the 108 was further extended from Stratford to Wanstead replacing part of route 10 (once Abridge – Victoria, but by then only running as far out as Wanstead). Although the approach roads on both sides of the tunnel have been massively upgraded, in connection with the new southbound bore, the 108 takes many “long cuts.” Buses leaving both Stratford and Lewisham operate via the shopping areas, and in both directions deviate to serve Bromley High Street in Bow (not a shopping area! ), resulting in southbound buses circumnavigating the Bow roundabout twice; northbound buses serve the only surviving part of St. Leonard’s Street (the rest having become the Blackwall Tunnel Northern Approach). Southbound buses also deviate via the Tesco in Hancock Road and via Gillender Street, but northbound buses have stops on the dual carriageway. Finally, and most recently, the 108 became the first bus route to serve the Millennium Dome at North Greenwich during construction, and as initially this stop was inside the security area, only staff were allowed to alight. This deviation has added nearly 10 minutes to the through journey time, partly because of an unusual 3 minute hesitation scheduled at North Greenwich, and sometimes it was possible to alight from a northbound bus in Blackwall Lane at the start of the double run and walk round the corner into Tunnel Avenue to catch the previous one! From 1989 the route was won by Boro'line Maidstone using a batch of new Leyland Lynxes (G34-45 VME). Boro'line subsequently collapsed and was bought by Kentish Bus. The 1993 Stratford area route scheme saw the section north of Stratford withdrawn, with links maintained by the 257 and 308, but the frequency on the remaining section was improved from every 15 minutes to every 12. The Lewisham scheme soon after in 1994 saw the introduction of Volvo B6 buses operated from Ash Grove garage – a type which has not had much success in London in either standard or low floor versions. Kentish Bus saw the route through a particular period of turmoil, with the redevelopment of Lewisham and Stratford town centres, and the major rebuilding of the East India Dock Road junction and streamlining of the tunnel approaches. Closure of the East India Dock Road bridge at weekends resulted in a lengthy diversion, with northbound buses via Cotton Street, Poplar High Street, Bazely Street, Chrisp Street, Violet Road and Devas Street to rejoin the normal route, and similarly southbound via Twelvetrees Crescent, Devas Street, Violet Road, Chrisp Street, Bazely Street, Aspen Way, Leamouth Road and East India Dock Road. In addition, routine maintenance work often takes place at night, with one or other or sometimes both tunnels closed between about 2100 and 0600, and buses are then diverted via Tower Bridge. A major surprise in 1997 was the award of the route to a newcomer to London Bus operations, Harris Bus. 11 new Optare Excels were purchased, restricted in length to the 10.7m version due to a new deviation in Blackheath via Prince Charles Road instead of Prince of Wales Road. 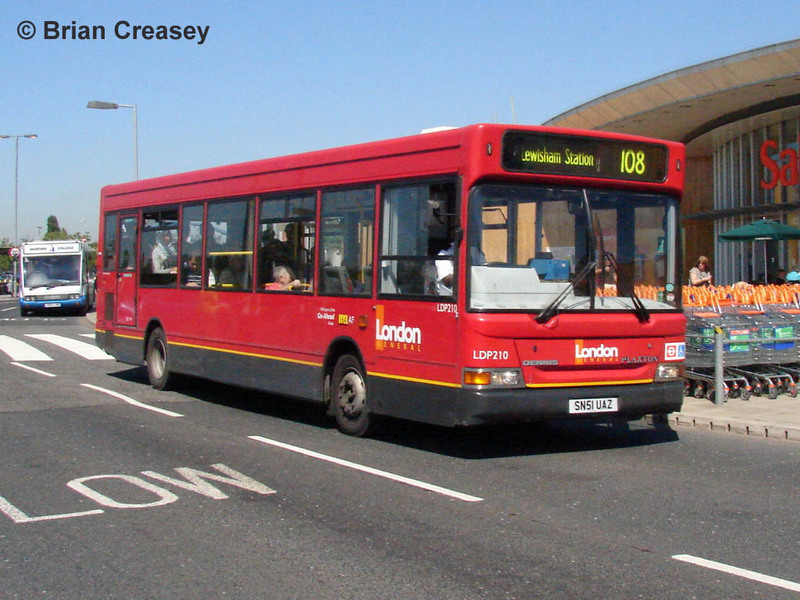 Buses were initially operated from the firm’s far-away base in West Thurrock, although the subsequent win of routes 180 and 132 saw operation transferred to a new base in Belvedere. Harris Bus got into serious financial difficulties late in 1999, and as a result operations of its LT contract routes was taken over by a new subsidiary of LT itself, trading as East Thames Buses. Harris’s colourful, albeit latterly rather scruffy, blue and green livery was sacrificed in favour of dull all-over red. ETB initially ran its routes north of the Thames from the former London Forest garage in Ash Grove, along with the Harris Belvedere base. Part of the 108 was based at AG, a neat coincidence considering that Kentish Bus operated the 108 from there for a while! Since takeover by Harris, the 108 has been diverted via North Greenwich, but to compensate reverted to the more direct (and indeed more useful) route across Blackheath via Prince of Wales Road. The frequency was further enhanced to every 10 minutes, utilising four earlier Excels made redundant by the loss of car park services at Lakeside shopping centre, but this is still not a patch on the 5 minute double deck service provided in 1933! Unfortunately, Optare Excels have not been known for their reliability, and East Thames Buses started to replace those on the 108 (and 132) with Dennis Darts surplus to requirements at Connex Bus (now Abellio London), with which ETB seemed to have a certain affinity for a while. However, in the interests of fleet modernisation, a decision was taken to acquire a batch of new Volvo Merit vehicles, which were delivered in 2004. Following the change of political control in London, the decision was taken to re-privatise East Thames Buses, and it was then sold to Go-Ahead London on 3 October 2009, which has since integrated the operation into its existing London General and London Central fleets. Operation of the 108 transferred from Belvedere to London Central's garage at New Cross from 1 May 2010, and the buses have now been painted into London Central livery. Ironically, having been the first company to go for allover red, East Thames's vehicles are now in the last fleet not to be all-red! DWL25 (FJ54 ZDZ) passes along Lewisham High Street on 4 August 2010, having reached here from Lewisham Station via Molesworth Street. This deviation is only served in this direction, due to the lack of a convenient pick up stop on the more direct routeing used by the 89; in the other direction buses set down at Lewisham Clock Tower, on the correct side of the road for the shops. At one time Lewisham High Street was only served in shopping hours, but is now served all day (and night). The Merit is in reality a VDL (DAF) SB120 (itself quite similar to a Dart) with Wright Cadet bodywork, but sold by Volvo – which presumably explains the DWL class code. Reliability of Merits (and Cadets) has not been a whole lot better than the Excels, and so Darts are still commonplace, though nowadays they are indigenous Go-Ahead London vehicles. A sample is provided by LDP210 (SN51 UAZ) at the Greenwich Peninsula Sainsbury’s on Thursday 3 June 2010, evidently transferred from Putney garage quite recently judging by its AF garage code. It is still carrying old-style London General logos, quite ironic as the route had only just transferred from Belvedere which remains a London General garage!